A steam plume blows south from the peak of Pagan Island’s northernmost volcano in this photograph by an astronaut on the International Space Station (ISS). Pagan is part of the Commonwealth of the Northern Marianas, an island chain of volcanoes that form the margin between the Pacific Ocean (to the east) and the Philippine Sea (to the west). Pagan is made up of two stratovolcanoes separated by an isthmus, and it is one of the more volcanically active islands in the Marianas. The island was completely evacuated in 1981 when a large eruption forced the small Micronesian community to flee. 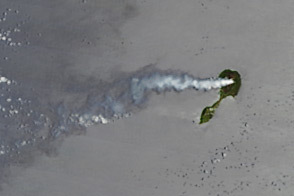 Before the early months of 2012, the most recent eruption occurred in 2010. The islands themselves mark the tectonic boundary where the old, cold Pacific plate is being subducted at the Marianas trench beneath the younger, less dense crust of the Philippine Sea. The subduction results in substantial volcanic activity on the upper plate, forming the island arc of the Marianas. Considered to be one of the classic examples of an oceanic subduction zone, the Marianas Trench includes the deepest spot in the Earth’s oceans (more than 10,000 meters). 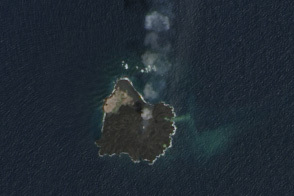 The foreshortened appearance of the island is due to the viewing angle and distance from the space station. 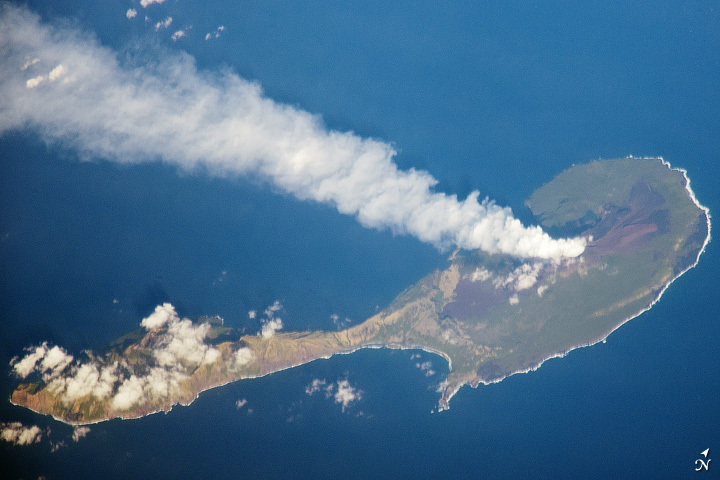 The ISS was located over the Pacific Ocean approximately 480 kilometers to the southeast of Pagan Island when the image was taken. Visit this page for another image of Pagan Island. Astronaut photograph ISS030-E-122047 was acquired on March 6, 2012, with a Nikon D3X digital camera using an effective 1200 mm lens, and is provided by the ISS Crew Earth Observations experiment and Image Science & Analysis Laboratory, Johnson Space Center. 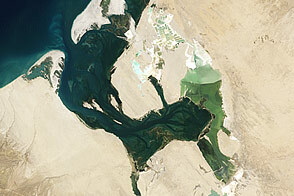 The image was taken by the Expedition 30 crew. 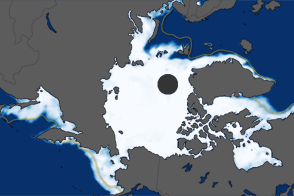 The image has been cropped and enhanced to improve contrast, and lens artifacts have been removed. The International Space Station Program supports the laboratory as part of the ISS National Lab to help astronauts take pictures of Earth that will be of the greatest value to scientists and the public, and to make those images freely available on the Internet. Additional images taken by astronauts and cosmonauts can be viewed at the NASA/JSC Gateway to Astronaut Photography of Earth. Caption by Cynthia A. Evans, NASA-JSC. The island sits along the tectonic boundary where the old, cold Pacific plate is being subducted at the Marianas trench. Starting in 2009, and continuing into 2013, North Pagan Volcano has emitted intermittent plumes of gas and ash.